After enjoying the sweetness of Nice’s hinterland, we planned a little trip to Italy to meet the austerity of walls that do not see the sun. 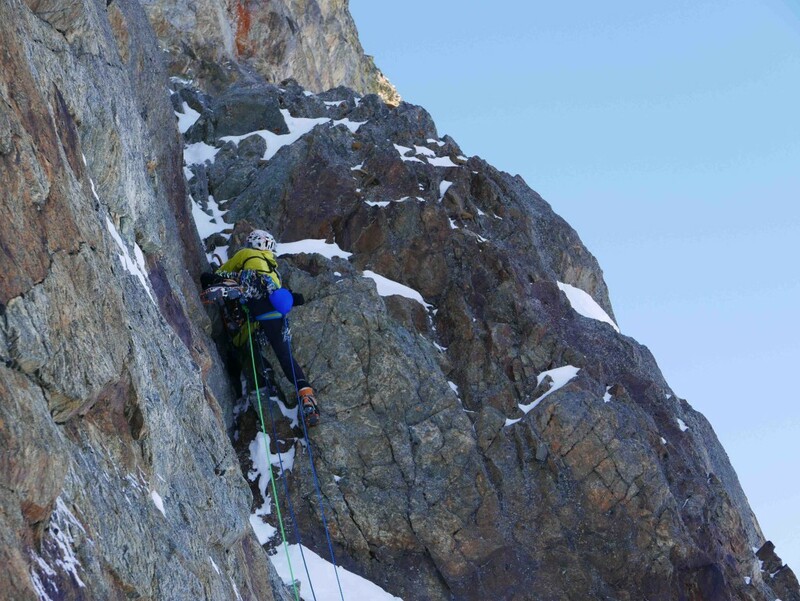 Going along with Christophe Dumarest, we switched over the Italian side to rub the famous north face of Corno Stella. 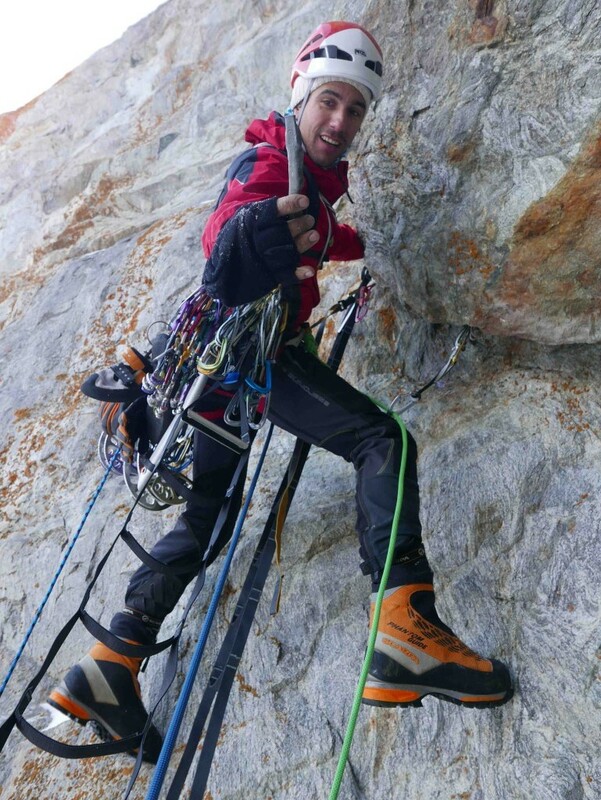 One of the last walls climbed by Patrick Berhault during his crossing, and our first big goal! We had promised not to make a winter ascent again after a bad experience in Vanoise. 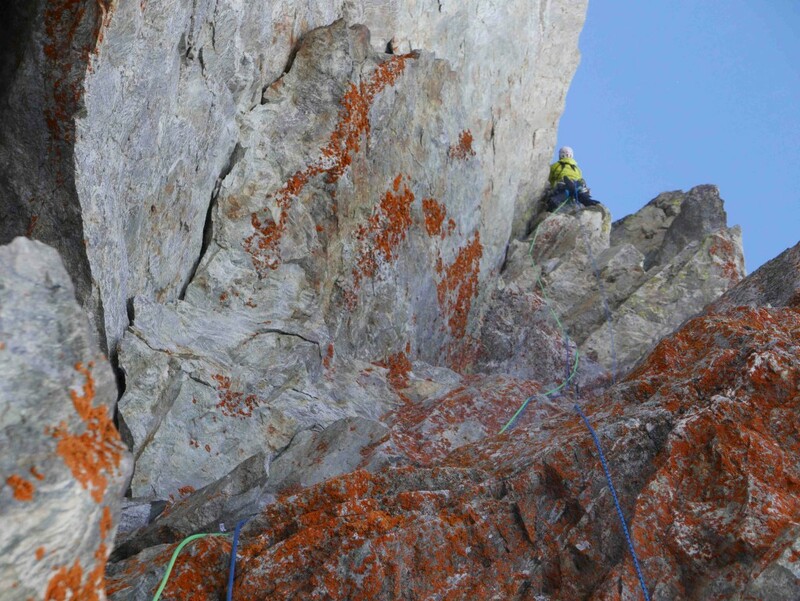 Well, we put it aside, but for a route that influenced a whole generation of climbers… In 1962 Ughetto and Ruggieri opened the Red Dihedral with revolutionary wood wedges. 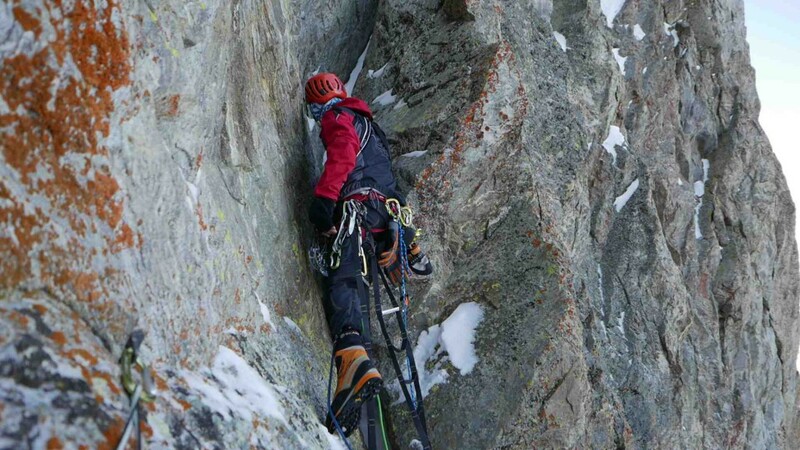 Definitely a feat, and we consider it a little more this way at every climbed meter. 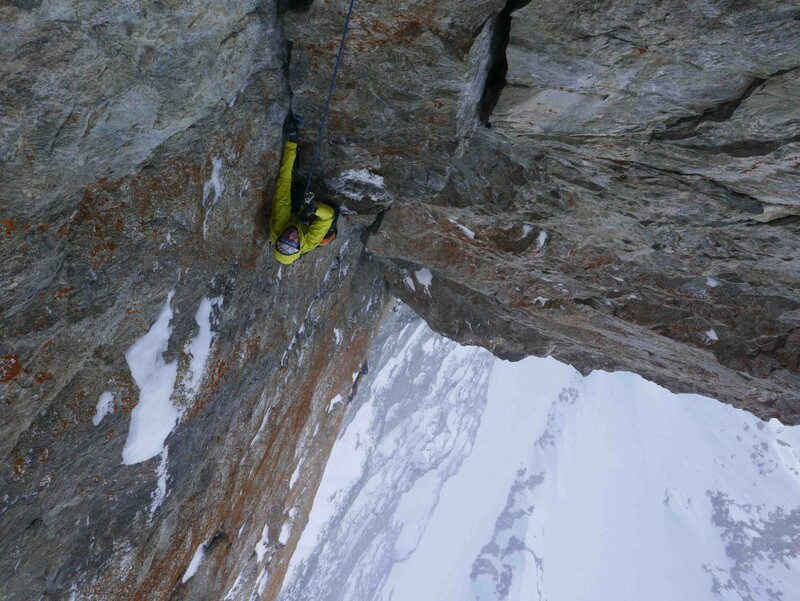 Just as the Berhault ascent of the same way in a winter solo! A really off the scale kind of man! After a tiring approach from Saint-Martin-Vésubie fortunately made easier thanks to Antoine Rolle and Olivier Vigouroux coming to help us carry our bags, we meet with Christophe at Valdieri Termes then we go up to the Varonne bivouac. It only slightly emerges from the thick snowpack. A few shovel strokes later we find ourselves in a little haven of comfort in this cold and barren world. 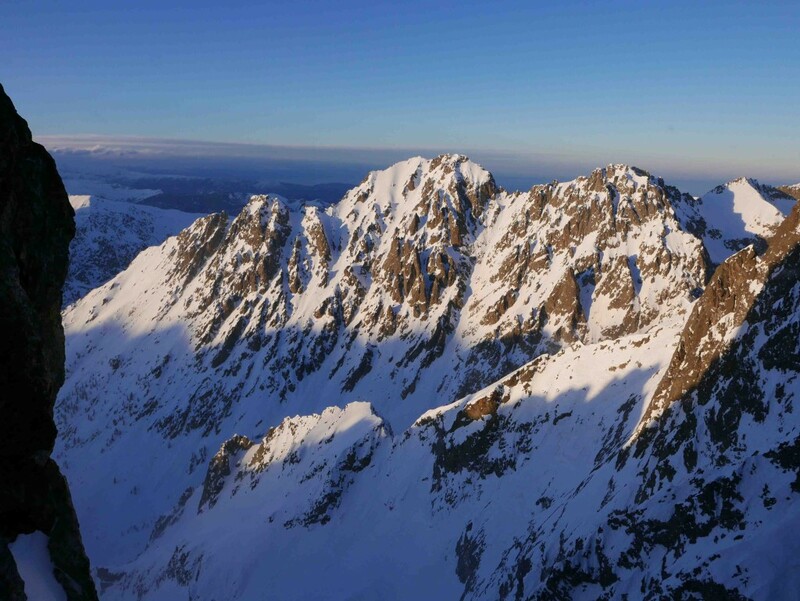 Above us, the 900m of the Lourousa couloir and especially the impressive north face of Corno Stella! 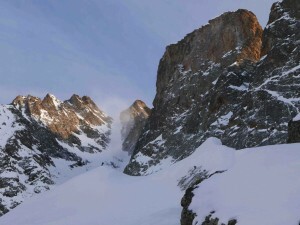 We plan to climb the face in two stages. The first day will be devoted to the ascent of the pedestal pitches which give access to the dihedral itself. 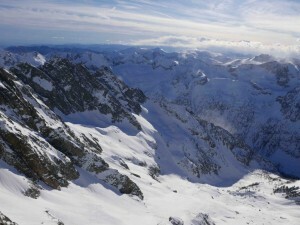 We will climb these first four pitches by means of modern techniques for mixed climbing, armed with ice axes and crampons. 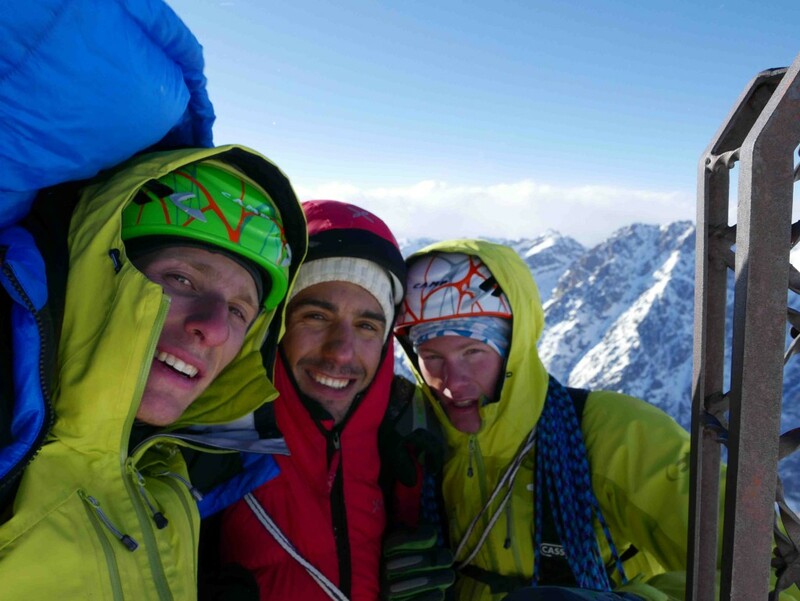 Yoann will take care of the first two, and Yann of the following two! Then we will head-up to the bivouac to rest a little before the big next day! Wake-up: 3:30. As usual these wake-ups bite are a little bit harsh, but the day will be a long one, and every minute of the day counts. So we want to get to the highest point reached yesterday at dawn. Through an auto-handle system, we climb the ropes left the day before. After having reached the dihedral, Christophe embarks on the first length. Immediately the crack is very wide, and he choses a half free/half artificial climbing strategy. In the summer, we’d climbed with rock climbing shoes, and we would have progressed quickly. But in winter, low temperatures are pushing us to keep our big “Phantom 6000” boots on. These have thermal slippers, specially designed for this kind of ascents. As seconds, we try to be as efficient as possible, progressing mostly with ascenders. At one point, while Yann is hanging on an existing anchor a piton snatches carrying with it a large block of rock. 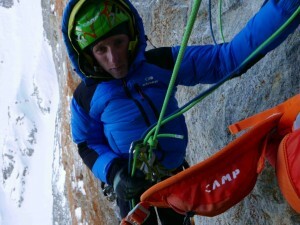 Fortunately Yoann who sits just below, is protected by a small roof. In its stride, Christophe goes to the next length: a canted horizontal crack, which becomes vertical, and even wider than the preceding ones. The postures are awkward! 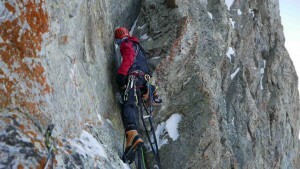 Yann takes over in a still large crack, where the largest of our friends (# 6 Camalot) is much too small. Only an antique wooden wedge allows us to rise somehow. With an indescribable creep, he manages to climb the few inches that were missing to reach, at arm length, a tightening of the crack, and there inserts our largest friends. It is in this “old style”climbing that the bonding between the climber and the rock is the strongest. Indeed, the whole body is called upon to jam and progress in these very large cracks. 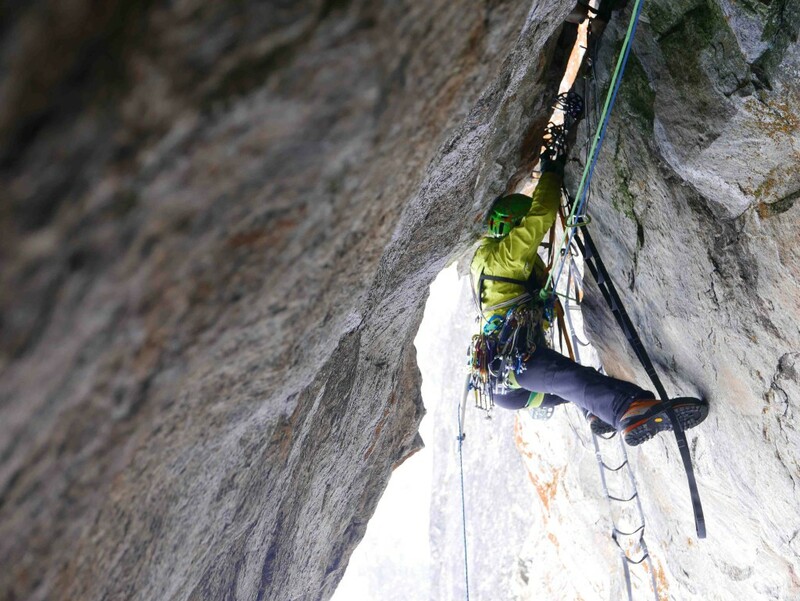 The next pitch is the free climbing “crux”, it is a large roof crossed by a crack, again very wide! 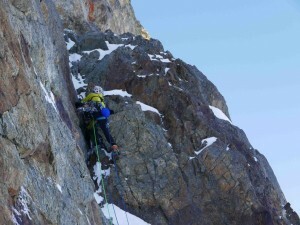 Rated at 7a + by Patrick Berhault, we aid climb it. Unlike the previous pitches, the equipment is rather serious. This is again the famous wooden wedges designed and manufactured especially by the Ruggieri Ughetto roped party to open this route. Two wooden cubes connected by a threaded rod, this is the first time we meet this kind of protection! While most are genuine, two of them have been replaced! After clipping the first two wedges, Yann poses a very doubtful, because very open, # 5 Camalot,! In a split second, he finds himself hanging on the rope a few meters down, hanging on the first wooden wedge. The friend had slipped, and the last clipped wooden wedge had shattered, lost in the slowly growing abyss! What a fear but no harm! We meet at the Anchor, this time it’s Yo who gets going. Despite the cold, he will climb with rock climbing shoes; on frozen strips it still better than big boots! Alternating cracks and dihedral, sometimes snowy, we progress to the top. In summer, it must be a real treat! Focused, we are completely absorbed in the effort, nothing else exists except the 3 square meters of rocks around us. So when suddenly the sun hits on our faces is like a rude awakening, the return to reality, in front of a magnificent landscape that opens your eyes. An intense moment as we meet at the cross, in a raging wind. Quickly, we must descend before dark, and gusts redouble their intensity. Waooh the night will be so good! There is a rappel line anchored in the north face. But after a hundred yards downhill, the cord gets stuck … just above compact slabs. Going back up would take too much time, we continue our descent the best we can. But the anchors are now hidden by snow patches and we need to put pitons to cross over to the Red Dihedral line. 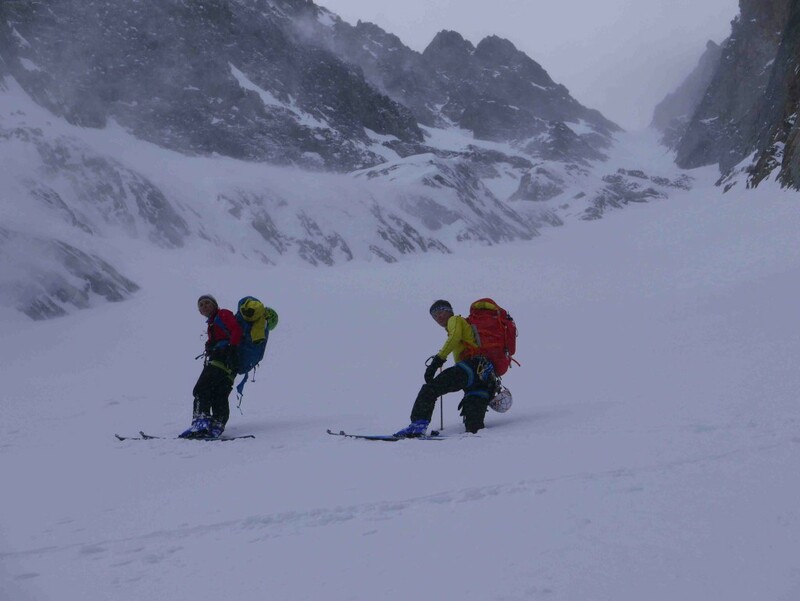 It’s dark when we step in the Lourousa couloir, exhausted we are. It becomes difficult to keep our balance in the wind, and Yann let a boot-shell fall! We quickly descend the couloir hoping to find it, but the snow purges are too abundant and it is quickly covered. This is the “Borgnette” too much, which drain Yann’s morale to the extreme. 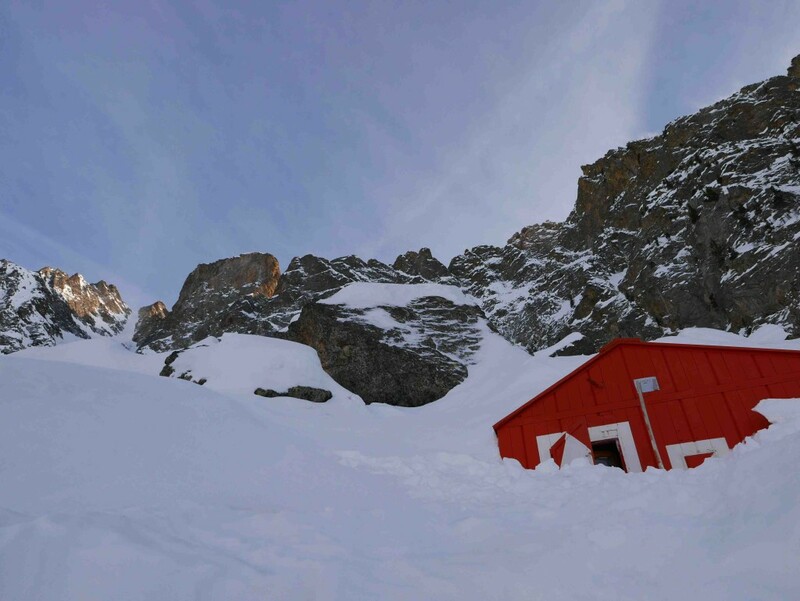 Meanwhile the two slightly calmer companions find the bivouac buried under the snow. And when we close the old door behind us, everything stops, and suddenly the calm returns! We leave the storm, letting out there this so hostile world to man. What happened today was quite an adventure in itself, part of the broadest adventure. We enjoy a piece of foie gras brought by Christophe, thinking of the boldness of the veterans who have gone there before us, with the means of the time … Respect. After a restful night we descend to Valdieri, sandwiched between gear bags and a crusted snow. Christophe hits the road and we feel somewhat strange watching our friend going away to his family, to meet the human life down there… For both of us it’s the reverse, we go in the opposite direction, upwards. The journey continues and we snap-on our skis for a big bonding step towards France. After all the accumulated emotions and fatigue of the recent days, we feel truly detached. In addition, we are going through wild landscapes with no one around for kilometers… We are moving ahead somehow out of the real world, legs moving by themselves and spirit wandering. At dusk we reach the Druos pass marking the border. A bright orange lights-up the horizon to the west! Bad weather will be here tomorrow. At the bottom of the slope on the French side, Isola 2000 lights glitter. We stay at the pass for a moment, in the open wind, to enjoy our freedom. We do not even know where we will sleep tonight, it’s improvisation adventure. But as always, we are welcomed with open arms; this time by the ski school. The encounters follow one another; Another essential component of the trip.